We start with a pretty red soft cotton onsie and add a skirt bottom using the fabric "Zillions of Hearts" by Michael Miller. The bottom of the gown is finished with elastic to keep the gown over baby's legs for warmth. The red bodice is is appliqued with a cream heart using zig zag bean stitching. Your little one's 3 initials are monogrammed in the heart in pink Fancy Script font. 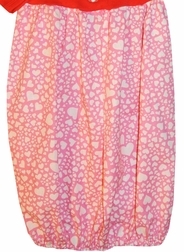 Hearts are universal so the gown can be worn in Spring and Summer long after Valentine's Day.